Put popped popcorn in a very large bowl. Melt white chocolate chips in 30 second increments in the microwave until melted. Stir in Crisco until completely incorporated. Add dry yellow cake mix to melted white chocolate mixture and completely stir together. 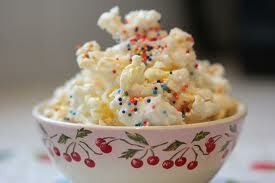 Working quickly, pour over popcorn and using two large spoons, toss until evenly coated. Pour onto sheets of waxed or parchment paper…then sprinkle liberally with sprinkles. Let completely cool. Store in an airtight container.